Hello Ladies! I hope your week has got off to a good start and your Monday's haven't all been too terrible, although this weekend seemed to fly by! In fact, the whole year is flying by, it doesn't seem that long ago since I was packing my things and moving to London - now I'm starting to think about buying Christmas presents! Anyway, I was recently contacted by Wildly Natural Cosmetics asking if I would like to try some of their products. I always love to discover new beauty brands as you really never know what hidden gems are out there until you try them, so of course I said yes. I was sent four eyeshadows and two lip products all in cute little sample pots, so I can't comment on the packaging you would receive the actual product in as I haven't seen it myself. Wildly Natural Cosmetics are all handmade by a licensed Esthetician and pride themselves on being all natural cosmetics which not only looks great, but are good for your skin too. The product I was most impressed by were the eyeshadows. They are loose powder eyeshadows and all of the shades I received were shimmery, although there are many more variations on their website. 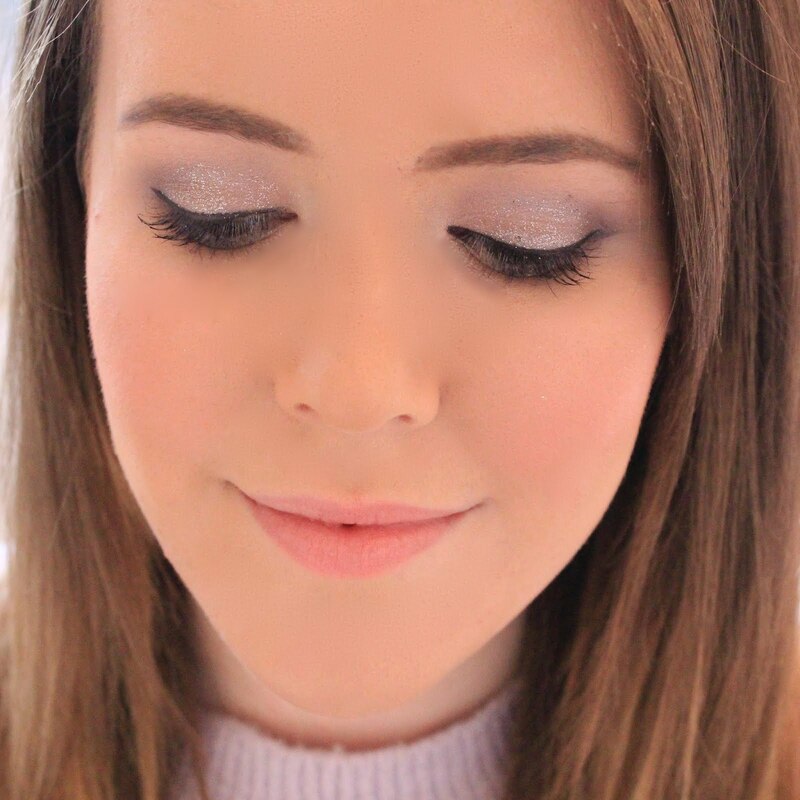 I personally don't mind using loose powder eyeshadows and am a big lover of the Bare Minerals eyeshadow pots, which these are extremely similar to. However, those Bare Minerals eyeshadows will set you back around £15, whereas these only cost £6. So if you're looking for a cheap alternative, look no further. 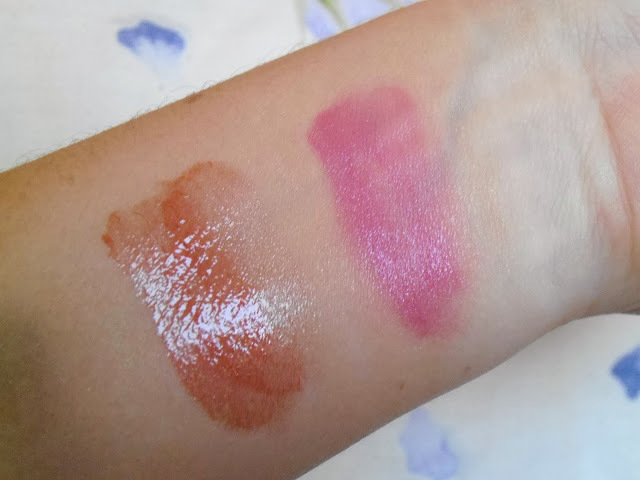 The four colours I was set are (left to right) Amethyst which is a lovely deep violet colour, Satin which is a great dupe for MAC vanilla pigment and can be used as an eyeshadow or highlight when dusted lightly over the cheek bone, Bronzed which is a warm bronze shade and Blushed which is a lovely bronze/pink colour similar to Sin from the Urban Decay Naked palette. 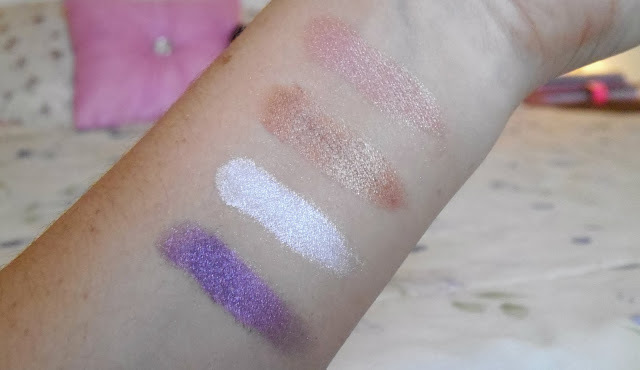 What I really liked about these eyeshadows were the pigmentation, it didn't take very much product to produce the colour intensity which you see in the above picture and the shadows are so soft to apply too, making them perfect for sensitive eyes. I was also sent a lipgloss, which is the reddish colour in the above picture and a lipstick, which is the barbie pink colour in the picture. The lipgloss was actually quite pigmented when applied to the lips although it doesn't look it in the picture and smelled very Christmassy if you ask me, kind of like a Christmas spice scent. I'm not sure if this is related to the colour at all but I think it goes nicely with the red colour. The lipstick I was sent was called Roxy and is actually the perfect dupe for MAC Speed Dial. I'd say Roxy was the slightest bit more blue toned as it does make your teeth look whiter but they are almost exactly the same. The lipstick also smells a lot like a Burts Bee's lip product I used to have, making me think that it contains bee's wax. It was also a hit with me as it kept my lips moisturized and stayed on after eating which never really happens to me! 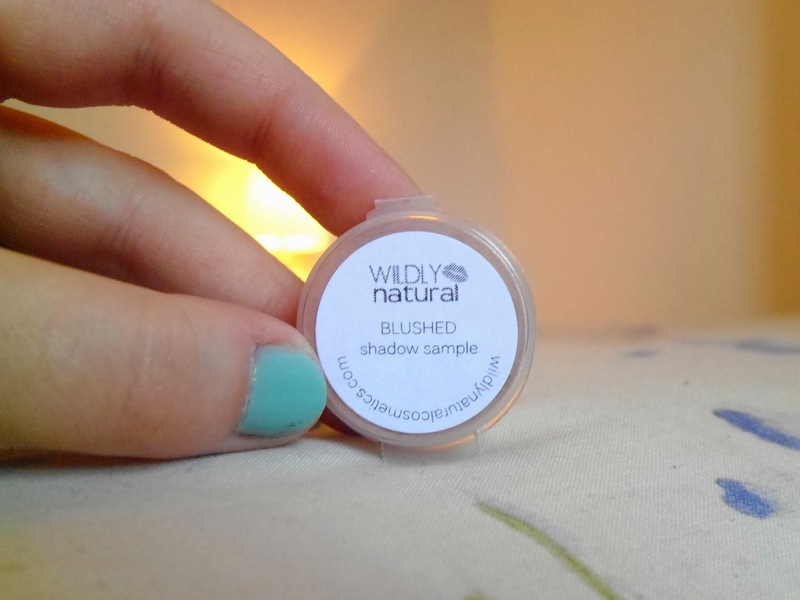 If you'd like any more information about Wildly Natural Cosmetics or want to check out their range for youself you can do so here. Those eyeshadow shades are so so pretty! I love how bold the colours are. I like the look of the lipgloss. And it sounds like it would make a nice little festive treat for someone! Blushed is such a gorgeous colour I love how pigmented it is! Urban Decay's Sin is one of my favourite eyeshadows so I'll defo need to check this out. Those shadows are SO pretty!!!!! !